The tickets purchased are for your own personal use only and may not be transferred or re-sold to any other person or body under any circumstances or used as part of any promotion or competition or for commercial gain. Where there has been any re-sale or attempted re-sale of any tickets (or any other breach of this term), we reserve the right to cancel the relevant tickets with immediate effect and refuse admission to Wings & Wheels using that ticket. The original conditions of sale will be enforced. Tickets are non-transferable under any circumstances and any resale or transfer, or attempted resale or transfer, will invalidate any ticket purchase made. When tickets are being collected at the box office, we ask that the cardholder presents the card that the tickets were booked on as identification. Any other forms of i.d. or letters of authorization are taken at your own risk and may result in the tickets being withheld at the box office. Once purchased, tickets cannot be transferred, exchanged, refunded or returned unless the event is cancelled, moved to another date, or if details of the event are significantly changed after an order is placed (significant changes being a change of venue or show date). It is the responsibility of the customer to inform Wings & Wheels of any change of address, contact phone number or email address, both before and after receipt of the goods. Please note that our preferred method of contact for customers booking online is by email, so care should be taken to provide a current, valid email address. The right to admission to Wings & Wheels is reserved by the promoter and event venue, who may take health and safety, environmental and security concerns into account at their reasonable discretion, and may from time to time carry out security searches. Wings & Wheels would advise customers that no refunds will be offered to customers who are refused entry or ejected from a venue on account of late arrival, declining to be searched, abusive, threatening, drunken or other antisocial behaviour (including smoking in no smoking areas), carrying offensive weapons or illegal substances. If it becomes impractical to post tickets out, due to the proximity of the event or circumstances beyond our control, we reserve the right to make tickets available for collection at Wings & Wheels immediately prior to the event. Customers will be notified by phone, email or in writing (using the details provided at the time of ordering) if this becomes necessary. If tickets that are despatched are returned to Wings & Wheels as "addressee unknown", we reserve the right to cancel the order. We will not share your personal information for marketing or any other purposes without your consent unless where required by law. If you have registered your interest with wingsandwheels.net and/or any of our associated companies, and thereby given your consent, you may be contacted with relevant promotions, offers or information that you have expressed an interest in or that might be of interest to you. IF YOU DO NOT WISH TO RECEIVE FURTHER UPDATES PLEASE CLICK HERE. We will always respect your privacy and any personal communication between you and ourselves. We will always comply with any data protection legislation currently in force. Still confused? 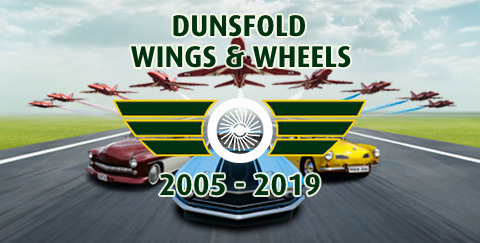 Then contact Wings & Wheels customer services at Wings & Wheels, Building 56, Dunsfold Park, Cranleigh, Surrey GU6 8TB or call 01483 542226 for help.